Physical characteristics: Black-and-red broadbills are beautiful crimson and black birds. They have a black head, back, and tail feathers; crimson red underparts, rump, and throat; black wings with a white narrow stripe; and a bill that is pale blue on top and yellow below. Adults are 8.3 to 9.4 inches (21 to 24 centimeters) long and weigh between 1.8 and 2.7 ounces (50.0 and 76.5 grams). Geographic range: They are found in Borneo, Myanmar, southern Thailand, southern Laos, south Vietnam, peninsular Malaysia, and Sumatra. 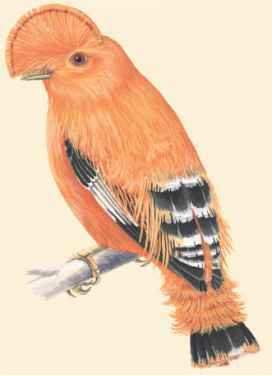 Habitat: Black-and-red broadbills occupy areas with water within evergreen forests. Diet: Their food consists of mostly insects, but also mollusks, crabs, and small fish. Behavior and reproduction: The behavior and reproduction habits of black-and-red broadbills are not well known. They are usually found in pairs or small groups. Nests are often built in dead stumps or along bends in streams. The breeding season usually occurs in the dry season. Females lay two to three eggs. Males may help females incubate (sit on) the eggs. Black-and-red broadbills and people: There is no known significance between people and black-and-red broadbills.